Ajrak is a name given to a unique form of block-printed shawls and tiles found in Sind. These shawls display special designs and patterns made using block printing by stamps. Common colors used while making these patterns are not limited. 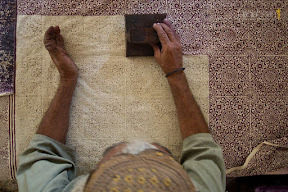 Over the years, ajraks have become a symbol of the Sindhi culture and traditions. Feb. 8, 2016, 11:21 p.m.